Greek culture - greek architecture and classical orders - Sailing in Greece and Turkey - Cultural holidays. Because of the seafaring nature of Greek civilizations, the majority of important archaeological sites and museums (including in what is nowadays Turkey) is ideally located to explore via sailing holidays. Anchoring alone in a bay overlooked by a temple is de rigueur, and even if there are tourists, the coaches will have left the site deserted usually well before the end of the afternoon. 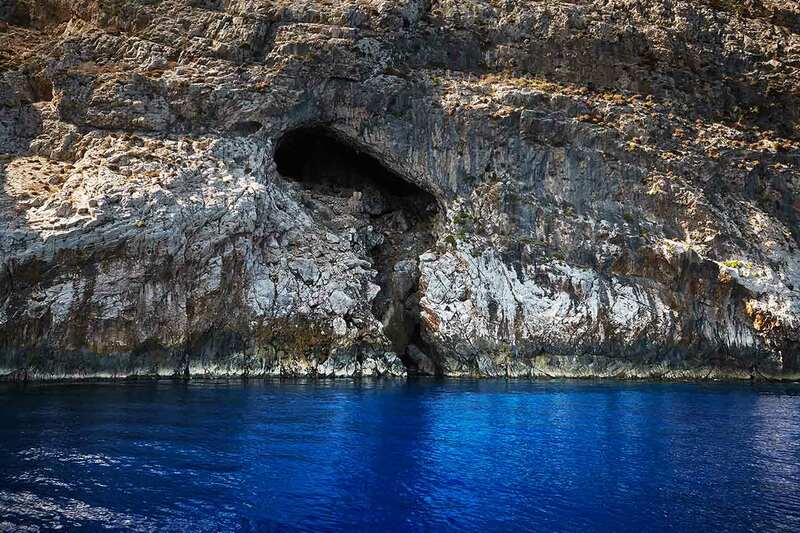 Folegandros - Just north of Karavostasi port is the "Golden cave" or Chryssospilia, impossible to anchor but in light conditions you can approach the stone steps with a dinghy. Delos - Temple complexes galore. Olympia: the Philippeion and other structures. Please click on the images on the right and below. 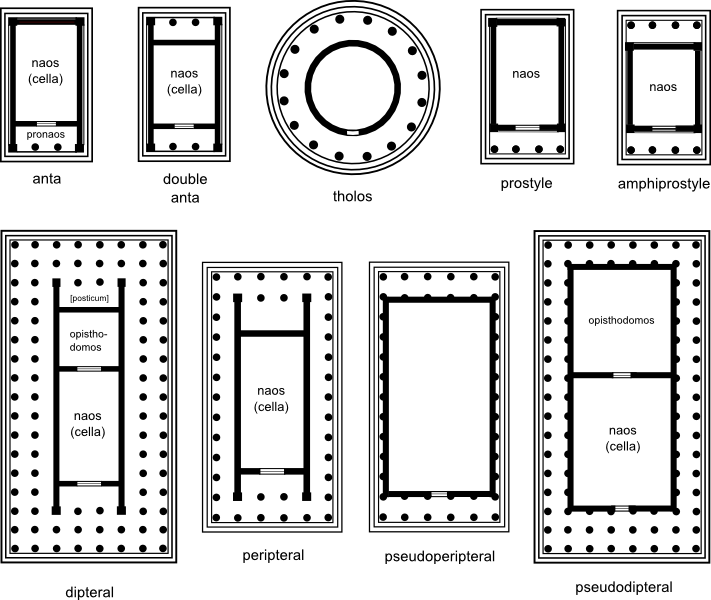 The simplest form of greek temple is the Temple in antis (A), in which the naos (cella) is preceded by a pronaos (antechamber) flanked by forward projections (antea) of its side walls. There are also examples of a Double anta temple (D), with antea at each side. Where there is row of columns in front of the antea (one column in front of each of the antea, with two or four columns in between) the temple is known as Prostyle (C). If there is a similar row of columns on the rear end of the temple it is known as Amphiprostyle (F). From the second half of the 7th century BCE the classical form was the Peripteral (B) temple, in which the cella was surrounded on all four sides by a colonnade (peristasis) (Parthenon, Athens). The Dipteral temple (E) has a double row of columns on all four sites (Temple of Artemis). A further type of temple is the Tholos (G), on a circular ground-plan (Epidauros, Delphi). Please click on the image on the right. In the Doric order the shaft of the column, which tapers towards the top and has between 16 and 20 flutings, stands directly, without a base, on the Stylo­bate above the three-stepped substructure (Crepidoma). The capital consists of the Echinus and the square Abacus and carries the Architrave with its Frieze of tri­glyps and metopes . The Ionic order - see this Ionic order image - has slenderer and gentler forms than the Doric, the 'male' order. The flutings of the columns are separated by narrow ridges. The column stands on a base (for example the Attic type base). The capital has typical spiral volutes on either side. The architrave is made up of three flate sections, each projecting over the one below. The frieze is continuous, without triglyphs to divide it up. This order originates from the Ionian Greek territories. Note the differences between Ionian and Ionic! The Corinthian order is similar to the Ionic except in the form of the capital. Its characteristic feature is the acanthus leaves which enclose the circular body of the capital, with tendrils reaching up to the corners of the concave architrave. This order was much favoured under the Roman Empire. The Tower of the winds on the Roman Agora. Independent advise on sailing holidays in Greece and Turkey. The ancient Diolkos and Corinth Canal.